An untold tale of Han Solo. Searching the planet Ventooine for a possible weapon called the Shadeshine, Luke, Lando & Threepio are chased into a temple by Stormtroopers. 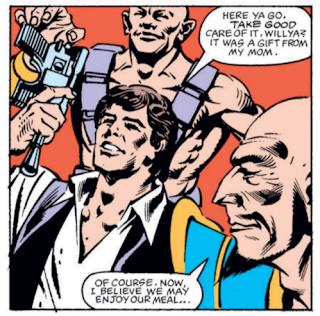 Inside, they discover a statue of Han Solo & a priest named Vetter Piin, who tells them that Han, having saved Piin's people from the Shadeshine, is considered the savior of Ventooine. He activates a recording made by Han, which recounts the tale. Landing on the planet in search of a valuable spice, Han inadvertently foiled an assassination attempt on Tieress Chrysala, consort to the ruling Satab. A grateful Chrysala took Han to the Satab's palace, where he learned the Satab was a cruel dictator ruling through the power of the Shadeshine, which burned out the user's body, forcing each Sataba to select a replacement while he entered the Hall of Satabs, to be placed in suspended animation until a cure is found. Having been selected to be the next Satab, Chrysala spared Han that fate by touching the Shadeshine first. Then Han & Chrysala prevented the former Satab from entering hibernation, forcing his body to burn out, after which Chrysala willing entered hibernation without naming a successor, thus ending the deadly cycle. Declared a hero, Han left the planet with the Shadeshine, which he destroyed aboard the Millennium Falcon. The story over, Luke manages to trick the pursuing Stormtroopers into entering the Hall of the Satabs, trapping them in suspended animation. As they Rebels leave the planet, despite not acquiring the Shadeshine, they are comforted by having once again heard the voice of their friend. This issue features Han Solo, bringing him back via flashback (told to Luke and Lando via a magic recording rock) to tell a tale from before he was captured and frozen in carbonite. Former series artist Carmine Infantino draws this issue, which makes the timing of the work involved curious. 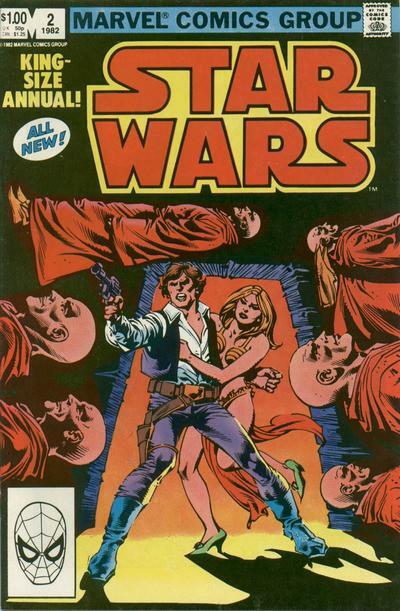 Infantino left the series before the Empire Strikes Back adaptation, and returned to DC Comics, where he remained when this issue was published. Which means he must have drawn it before he left the series, and it was held as a possible inventory story. But David Michelinie, the current writer of the series, is credited with scripting this issue, and he didn't come aboard the series until issue #51. So either Michelinie wrote this story as a one-off well ahead of his later work on the book, or he repurposed someone else's plot and/or script, and that person went uncredited. 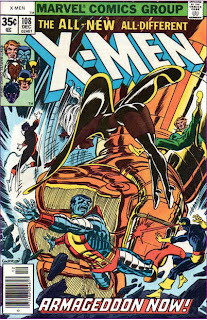 This issue also marks Infantino's last work on the series in any capacity. Since Infantino is drawing it, Luke is back in his white Tatooine pajamas. Ventooine is revealed to be a planet without any mechanical technology, which is one of those sci-fi tropes that always bugged me - it sounds like a clever idea in concept, but it doesn't really work. For one thing, while blasters may not exist on Ventooine, they do have some mechanical technology - a door is technology. So is a wheel. It's just a matter of degree. For another, everyone is amazed by Han's blaster, but while the locals on Ventooine may not regularly use sophisticated mechanical technology, they must be aware it exists - because they're not at all freaked out by the presence of what is essentially an alien, in Han, in their midst. Han says his blaster is a gift from his mom; joking or not, it's a rare reference to his parents. Luke and Lando deal with a trio of Stormtroopers who are far too cocky given the track record of Stormtroopers. Once again, the Rebel Y-Wing is capable of carrying three people, one more than it's actually able to carry. Han uses an idiom that name-checks Ord Mantell, the planet on which he encountered a bounty hunter just prior to Empire. He also refers to a loud noise as being like a "backfiring Sandcrawler", another irritating example of something from backwater Tatooine apparently being common enough to be part of the galactic lexicon. 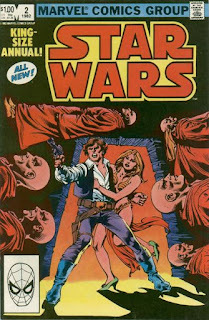 Using an annual to tell an untold tale of Han Solo is not a terrible idea, and an effective way of working the otherwise-sidelined character back into the series without running the risk of stepping on Return of the Jedi's toes or overly-disrupting the monthly series. Unfortunately, in practice, this issue is one of my least favorite types of Star Wars stories: a generic sci-fi story that, some basic window dressing aside, really has nothing to do with Star Wars. Aside from the name "Ventooine" for the central planet, there's nothing in the main plot that is relevant or reminiscent in any way to Star Wars, the characters, or the ongoing plotlines of the series. Han Solo is the starring character, but there's nothing about the story that requires the character to be anything more than a slightly-cocksure stranger with a gun - he doesn't even get to spend much time with Chewie! There's potential here to maybe get something out of the juxtaposition between the monks on Ventooine and the Jedi, or to draw comparisons between Han's interactions with a quasi-princess here and his later relationship with Princess Leia. But none of that happens, as instead Han just bumbles his way through a basic palace intrigue/power struggle story with sci-fi/fantasy trappings. 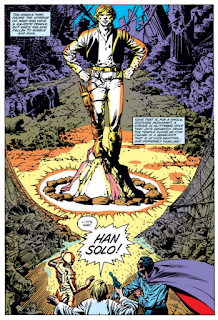 It also doesn't help that the scripting is bland (Han barely sounds like himself, possibly because Michelinie has never really written the character, and everyone else in the main story is as generic as the plot) and the art is lacking Infantino's usual exaggerated cartoonish-ness (presumably, Nebres' inks are responsible for the scratchy, cramped look, as Infantino's work is usually sharper and bolder). Bringing back Han for an untold tale is a fine idea; it'd just be nice if he was put to better use in a better story with better art before being figuratively placed back in carbonite. 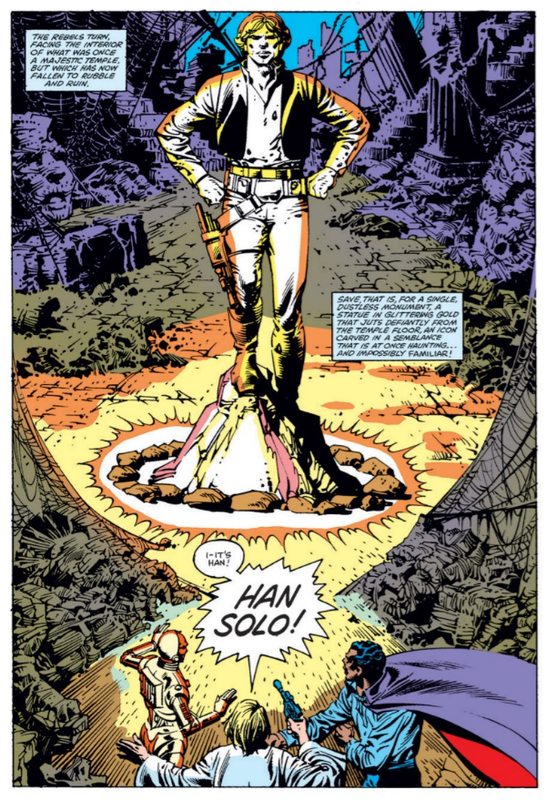 The Rebels actually search for Han in Star Wars #67. Agreed on the idea of telling an untold tale of Han in the annual, but also on the fairly generic sci-fi feel of the story and the odd level of technological sophistication. It’s far more in the Star Trek vein (TOS in particular) than Star Wars in that regard. However, I’m definitely higher on the art than you are — the Infantino & Nebres pairing makes for a surprisingly appealing one to me, with the lush, romantic inks on much or most of it being extremely heavy and to my eyes resulting in some very fine work that's (broadly speaking) in the Al Williamson vein. The name “Ventooine” actually doesn’t bother me in concept. If Tatooine and Dantooine are part of some kind of naming convention in this universe, at least, which is my own conceptual leap. The fail comes in circumstance as it’s a planet with no apparent knowledge of the Empire or former Galactic Republic and thus not part of the larger, interstellar society that would result in such a similarity. I don’t get why Chrysala went into the suspension chamber right away, rather than begin at least an abbreviated term as Satab to ease her people through the transition from being subjugated by autocratic rulers wielding the Shadeshine to a more democratic form of governance. Even if her smaller female body would burn out faster or something she'd likely have well more than half the normal reign of a Satab to live out. Forgot to add that Han’s “alien nomad” camouflage, due to the colors of the hat and cloak, reminded me of the relatively seldom seen Superman villain Terra-Man.